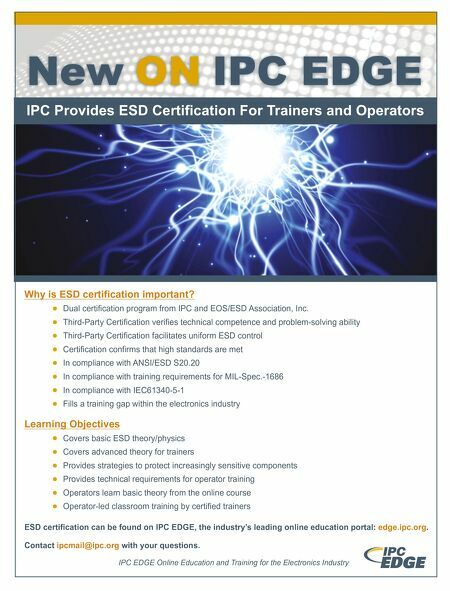 New ON IPC EDGE IPC EDGE Online Education and Training for the Electronics Industry IPC Provides ESD Certification For Trainers and Operators Why is ESD certification important? • Dual certification program from IPC and EOS/ESD Association, Inc. • Third-Party Certification verifies technical competence and problem-solving ability • Third-Party Certification facilitates uniform ESD control • Certification confirms that high standards are met • In compliance with ANSI/ESD S20.20 • In compliance with training requirements for MIL-Spec.-1686 • In compliance with IEC61340-5-1 • Fills a training gap within the electronics industry Learning Objectives • Covers basic ESD theory/physics • Covers advanced theory for trainers • Provides strategies to protect increasingly sensitive components • Provides technical requirements for operator training • Operators learn basic theory from the online course • Operator-led classroom training by certified trainers ESD certification can be found on IPC EDGE, the industry's leading online education portal: edge.ipc.org. Contact ipcmail@ipc.org with your questions. 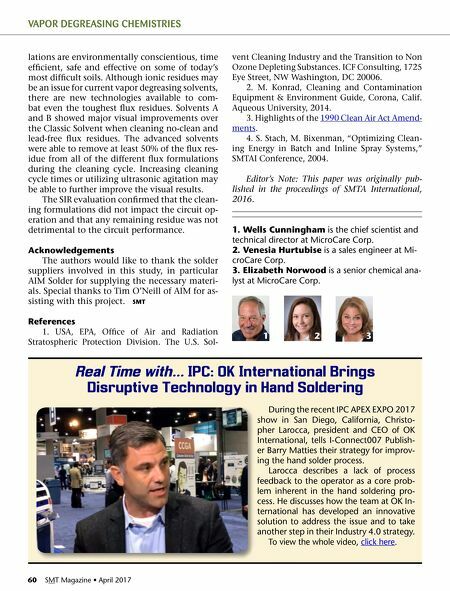 Column — What a Tangled (Soldering) Web We Weave!